1960 Gift Picture Frame. 55th Birthday Gift. 55th Anniversary Gift . 1960 saw the start of a new decade. We had a new president, John F Kennedy and his brother, Robert, was Attorney General. Miniskirts came in but the Cold War was a carry over from the 60's and would last until the 70's. For a thoughtful gift of that year, consider our 55th anniversary gift frame. See who else walked down the aisle in 1960: Jimmy Durante and Marjorie Little, Bobby Darin and Sandra Dee, Debbie Reynolds and Harry Karl, May Britt and Sammy Davis, Jr., Nancy Sinatra and Tommy Sands, Eartha Kitt and Bill McDonald, Marlon Brando and Movita Brando, Princess Margaret and Lord Snowdon are just some of them. This 1960 frame can also be an equally thoughtful 55th birthday gift frame suitable for any of these 1960 new arrivals: Prince Andrew, John Elway (Denver NFL quarterback), Sean Penn (actor), Hugh Grant (actor - Notting Hill), Julianne Moore (actress) and John F Kennedy Jr. 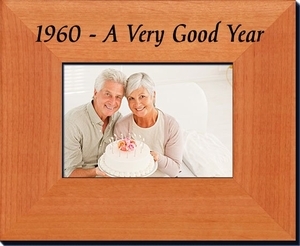 This picture frame celebrates the year with "1960 - A Very Good Year" engraved in its alderwood frame. The photo frame will hold a 3.5 x5" snapshot or picture. See also our other 55th birthday presents.